I don’t know if you remember me, my name is Amy and I was one of Henry’s nurses on the Children’s Center in Minneapolis. I was with you a lot before he got really sick, but I was visiting in California when he died. I said good-bye to him when he was sleeping the last night I worked with him because I was hoping he would be back with your family recovering at home when I got back from my vacation. Instead I got a phone call on my flight home and learned of his death, I was so devastated that my good-bye turned out to be a final one. I was thinking of Henry this year during Hannakuh, because he enjoyed opening the many presents from so many people who loved him. I remember him listening raptly to King Arthur, I think it was something his Uncle sent him. You told us about his teacher that loved him so much she wanted to have him back again. He got big eyes, was silent and beamed. Your love for each other made that room full of light and warmth. 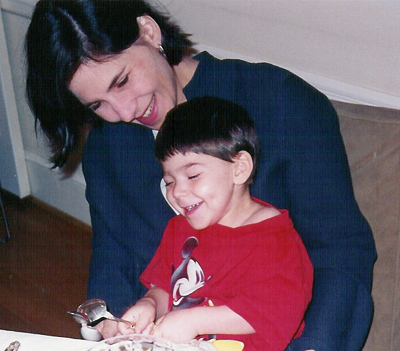 When I see the candles, I feel they symbolize the brightness and love your family embodied those evenings. It is Jack's birthday today. He is 8 years old. I am really happy for him but it is not far from my mind that you never made it to 8. Now Jack is clearly the oldest. He told Mom that he doesn't "know" Joe like he knew you. 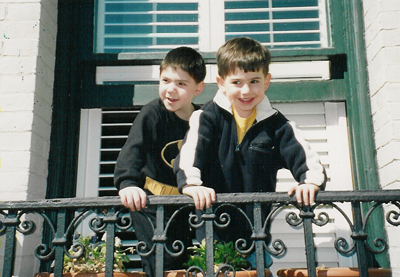 You guys were so close in age and so close as friends, and it is very different for Jack and Joe. 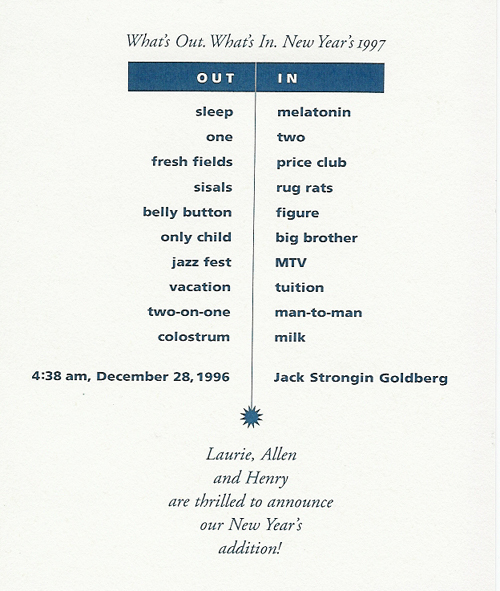 This is the birth announcement that Mom and I sent out when Jack was born. 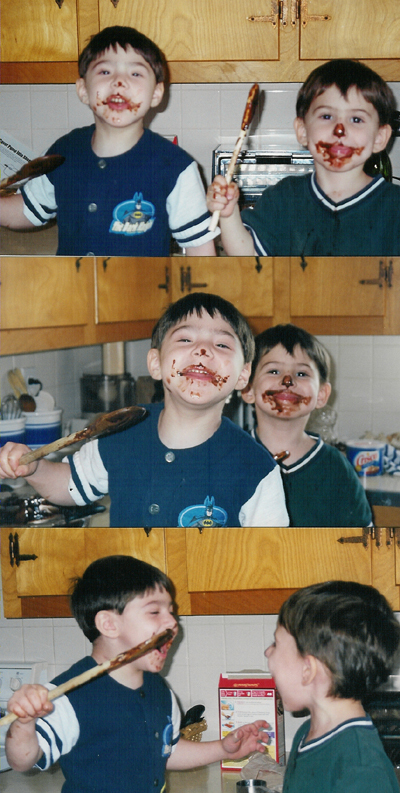 We had birthday chocolate chip cookies instead of cake because Jack isn't a big cake fan. 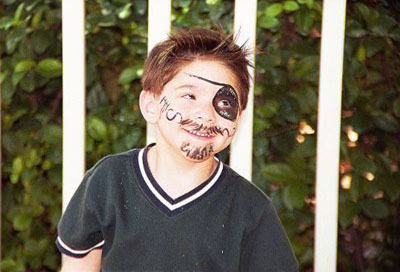 MINNEAPOLIS (Dec. 30, 2004) – In his short life, Henry Goldberg loved to laugh. 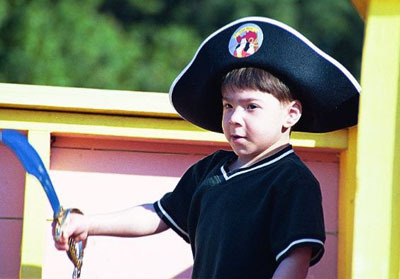 Even a courageous battle with Fanconi Anemia, a deadly genetic disease, didn’t take away his mischievous grin or his sense of humor. 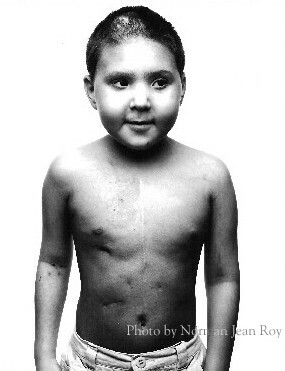 Henry underwent a bone marrow transplant at Fairview-University Children’s Hospital in July, 2000. Although he ultimately died from his disease two years later, his family has a message for patients facing devastating illnesses: Live well and laugh hard. 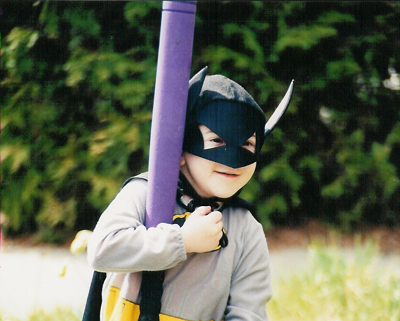 Henry’s parents, Laurie Strongin and Allen Goldberg of Washington, D.C, were so inspired by their son’s strength of spirit that they created the Hope for Henry Foundation. The foundation will provide up to 200 Fairview-University pediatric bone marrow transplant patients or oncology/hematology patients with a gift of electronic entertainment. 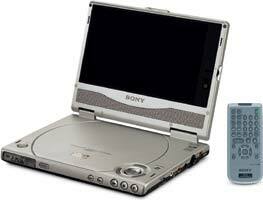 Patients age 2 to 18 can choose a digital camera, a portable DVD player, a Gameboy or a personal CD player. “The gifts from the Hope for Henry Foundation will make a big difference in the lives of children cared for in our hospital,” said Stacy Stickney-Ferguson, LICSW, a social worker with Fairview-University’s Blood and Marrow Transplant program. “These gifts will provide an emotional lift to our patients, many of whom have been in the hospital for months.” Since the program’s inception, University of Minnesota physicians have performed more than 3,700 blood and marrow transplants, making it one of the largest and most accomplished BMT programs in the world. 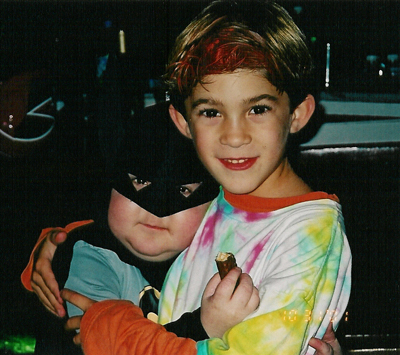 Henry Goldberg was a patient at Fairview-University Children’s Hospital for parts of two years, beginning in 1999. 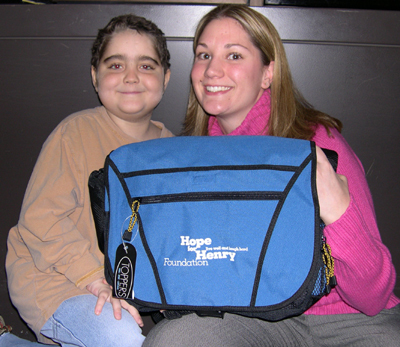 The foundation is also providing gifts to pediatric patients at Georgetown University Hospital in Washington, D.C., where Henry was also cared for prior to transplant. Patients who receive chemotherapy or bone marrow transplants often must remain in protective isolation for many weeks or months. The Hope for Henry Foundation is doing really well. We are putting up a website to let people know what it is all about. 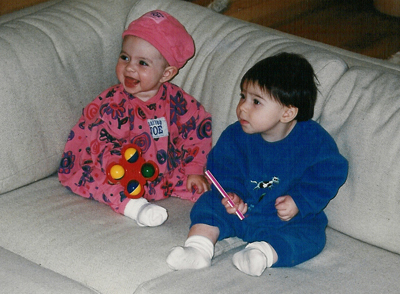 I was looking for a picture of you and Jack watching the portable DVD player that we can put on the site. Unfortunately the player is cut off in the photo. It is broken now and costs too much to get fixed but I don't think I'll ever throw it away. It means too much to me. I bought this for you when we made it to Minnesota for your transplant. It was one of the first ones ever, if not the first. There is a part of the ABC Nightline program on you that shows me holding the player so you can watch a Pokemon movie while you are in the CAT Scan machine. I hope that the kids who get DVD players from the Hope for Henry Foundation enjoy them as much as you and Jack. Jack did these in school. 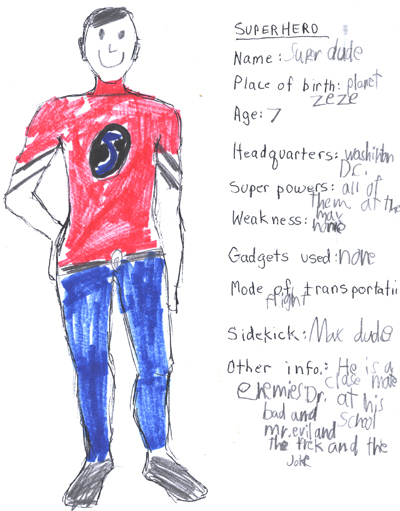 His favorite book is the DC Comics Encyclopedia. He reads it every day over and over. Joe is a superhero. His name is "Naked Boy." His superpowers are pooping on the potty and not making a fit when he gets his hair cut. I am going to take off some time from work next week and I will give you my Joe update. Joe and Jack went to the doctor this morning with Mom. We didn't know it but Joe dislocated his elbow yesterday. He was in a great deal of pain pretty much all last evening and night. We didn't know what happened to make his hand hurt and couldn't see anything and weren't sure if we needed to take him to the hopsital for an x-ray. He has complained about the same thing 2 other separate times months ago and then it went away before we went to the doctor. We thought it was the same thing and it would resolve itself. The doctor said that his elbow went back into place the other times and it was still dislocated when he took a look this morning. 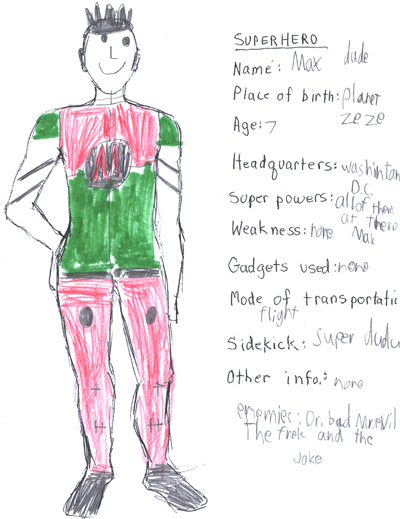 He has something called "nursemaid's elbow". Jack has a bad cough and Joe may have an ear infection on top of his elbow problem. I did a little more digging and look what I found! 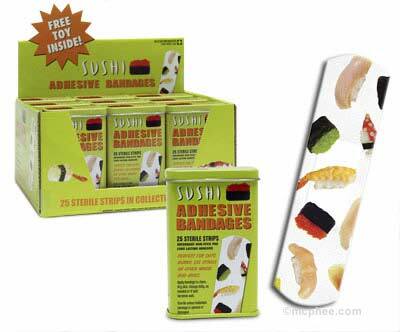 I ordered a bunch of these. How cool is this going to be. 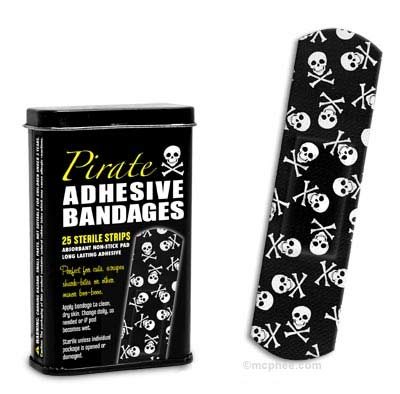 I bet the boys are gonna want the pirate bandaids. You would have been all over these. I bet there are other good ones out there like these. 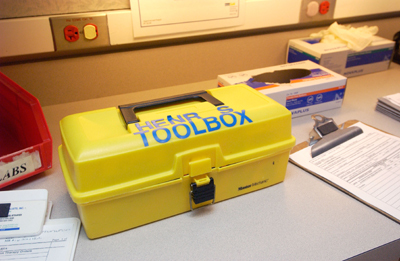 I have told you about Henry's Toolbox before but never showed you it. 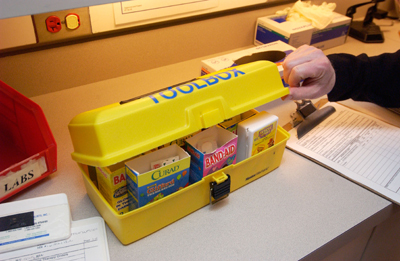 This is your old toolbox that we brought over to the clinic at Georgetown and filled with different kinds of bandaids, like Spongebob, Barbie and Scooby Doo. 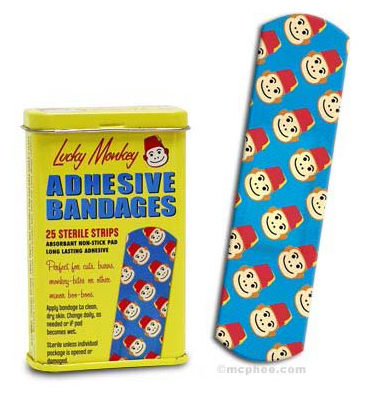 We wanted to make sure the kids have a choice of fun bandaids. I just found these. They are different but maybe too gross or grown up for the kids at the clinic. These are pictures from Minnesota. 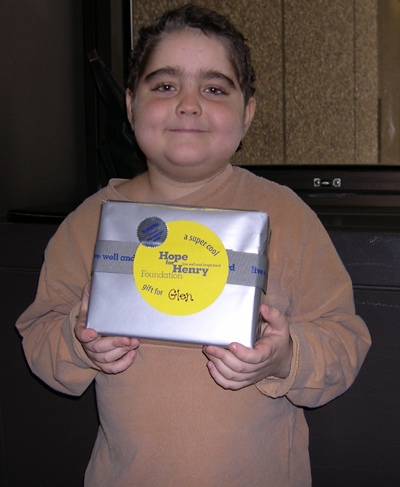 They are handing out Hope for Henry gifts at Fairview, just like Georgetown. Giving kids in the hospital stuff like Gameboys and DVD players helps them relax. Here is a story about that. Letting children play video games on a Game Boy in the operating room before undergoing surgery can help relax them better than tranquilizers or holding Mommy's hand, researchers say. Doctors found that allowing children a few minutes to play the games reduced their anxiety until the anesthesia took effect. Dr. Anu Patel conducted the study after noticing a friend's 7-year-old son was so absorbed with his Game Boy at a restaurant that he ignored the adults and the food at his table. "We find that the children are just so happy with the Game Boy that they actually do forget where they are," said Patel, an anesthesiologist at University Hospital in Newark who plans to present her findings Saturday at a medical conference. Patel said the findings could be helpful because many parents do not want tranquilizers given to their children. Youngsters who are traumatized before surgery run the risk of long-term psychological problems, including nightmares, bed wetting and fear of being alone. In addition, strapping a restless, frightened child to an operating table can cause a temporary blood pressure spike, make the heart race and trigger stress hormones that can delay healing, said Patel, also an assistant professor at the University of Medicine and Dentistry of New Jersey. Other hospitals have long used teddy bears and games to distract children before surgery, but those techniques are generally employed in patient rooms, playrooms and waiting areas, not in the operating room. At Children's Hospital of Philadelphia, kids are encouraged to play in waiting areas before surgery and to take a "comfort item" - occasionally a Game Boy - into the operating room. A Boston company, Design Continuum Inc., has begun testing a combination anesthesia mask and headset that would allow patients to play video games or listen to music, but distribution is years away. Patel studied 4- to 12-year-olds in three groups of 26 children each. All had parents with them in the operating room until they were anesthetized. One group also got a tranquilizer, and the third group played with a Game Boy. On average, the Game Boy group showed no increase in anxiety before surgery. But on a standard, 100-point scale for measuring preoperative anxiety, the tranquilizer group jumped 7.5 points and the parents-only group 17.5 points. Shani Willis, whose 10-year-old daughter Nykia had a cyst removed at the Newark hospital Tuesday, said the girl was nervous until she got a Game Boy. She then relaxed and played with it until she was anesthetized. "It was like she put everything out of her mind," Willis said. The hospital is considering making Game Boy use standard before pediatric surgery. 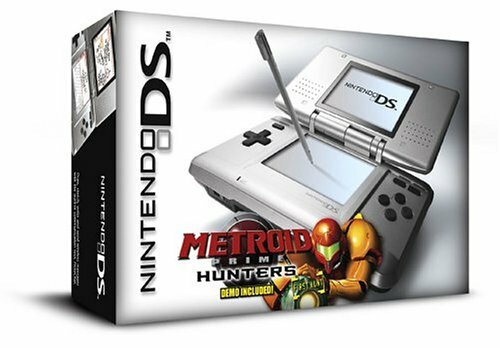 Dr. Erin Stucky, head of the American Academy of Pediatrics' committee on hospital care, said Game Boys should be used more widely in hospitals if a larger study produces the same results. "This is great because this offers a wonderful ability to have the child's attention immersed elsewhere," she said. All of your DC cousins and aunts and uncles and Nana and Papa went out for your deathday last weekend. First we went to lunch at your favorite restaurant, Cactus Cantina, and then we all went to the cemetery. At lunch, Nana had brought with her all of the photos that she had of you that she thought Mom and I might not have seen before. That was great. Here are some of them. The cemetery was pretty tough. We all said some stuff. Mom talked about you and how many lives have been changed and saved since you died. I said a prayer that I like. Everyone walked over to visit other graves and I was left alone with you. I kissed your headstone and then I just knelt there and looked at your grave and sobbed and sobbed. I went over and visited Grandma and you know something, I cried there, too. That was a first for me. I think I am just starting to really get sad about Grandma's dying. You were so sick and then you died and I just don't think I ever had time. I miss her. It is tough not having a mom. It is tough not having you. 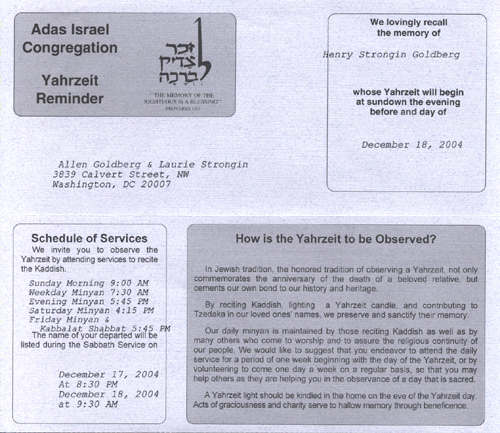 Today is my birthday and the anniversary of your death -- by the Hebrew calendar. Mom and Joe and Jack and I went to synagogue this morning. Helaine came too. That was really nice of her. 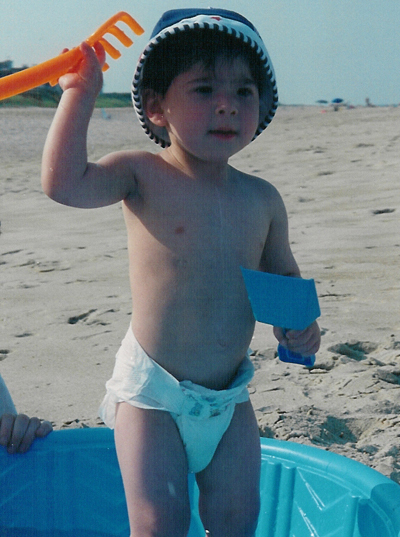 I wore your Pokemon kippah. There was a Bar Mitzvah. It was a guy who went to JPDS. That was a nice coincidence. Mom and I went out for dinner tonight. I wasn't really into "celebrating" my birthday. Is it too late to change my birthday? I don't think it'll ever be "Happy" again as long as it is a week after you died. I again didn't have a clue what to wish for when blowing out the candles on my birthday cake. I went blank. Next year I'll figure it out in advance. There are a lot of candles this time of year. We just finished lighting eight days of Hannukah candles and then it was time for your candle. I took your Yahrzeit candle into our room. It was downstairs in the kitchen, but I really felt like it was leaving you there while the rest of us were upstairs cozy in our beds. Sometimes it feels like two years, sometimes it feels like less, sometimes it feels like forever. I just read the blog I kept when you were dying. It is late and the battery on the computer is running out. I wonder if I'll be able to go to sleep. I think your deathday is harder for me than your birthday. I wonder what that means. I wonder if that will change. I wish I could cuddle with you one more time. 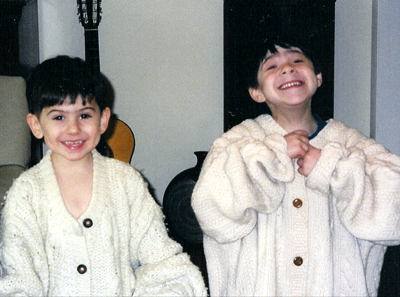 Jack was sooooo excited about the GameBoy. He leapt into my arms and gave me a full on, legs wrapped around hug. Tomorrow is your deathday. We are going to the cemetery. Jack has a good distraction in case he doesn't want to get too sad. Mom and I talked tonight about what we might do tomorrow at the cemetery -- what we might say. A bunch of people are coming, all your cousins and Nana and Papa Sy. I might say something about your life and Mom will talk about how you have touched people since you died. Joe knows about you and knows that you are dead. The other day when we were driving to school Joe asked me where we were. I said we on the way to school. That wasn't good enough. Joe said he wanted to know exactly where we were. I said that we were on the corner of 16th Street and Taylor Street in Northwest, Washignton, DC. He then started asking me about Aunt Tracey's dog, Taylor's, recent death. We talked about Taylor and then I figured I might ask him about your death, too. Joe said he knew that when someone like you, or a dog like Taylor dies people cry. He also told me that when you die you lose your friends. I said that Taylor and you didn't lose your friends when you died. I explained that you just couldn't play with your friends anymore. To Joe, you are his brother who just isn't here. Whenever I ask him where you are, Joe says you are "home." I once read that "Home is where you are loved." Now when we are in the car Joe always wants to hear Dogs Out. That is his cute way of saying, Who Let the Dogs Out. Remember when I bought that for you and Jack in Minnesota. 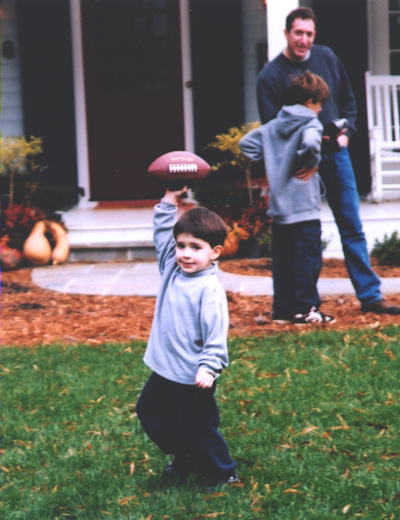 When we get to school it is always too early for Joe to go into his classroom so we play football downstairs in the Gan space. I bought Jack and Joe footballs for Hannukah. I made sure they got outdoor things as well as indoors stuff like the GameBoy.